We hear a lot about the power of the younger generation in the fight for queer equality, and this year there emerged one face, one voice from the crowd who stood up for herself, and by proxy, the rest of us. When boi-ishly handsome, 17-year-old Ceara Sturgis wore a tux in her senior photo, school officials tried to ban the picture from appearing in the yearbook, citing a rule about "cross-dressing" that turned out to be completely made-up. Rather than acquiesce to being excluded just for being herself, the openly gay high school senior spoke out about what was happening, garnering national media attention and becoming a spokesperson for gay rights practically overnight. One of the especially lovely things about this story was the support Ceara has from her mom, who has stood by her side, advocating for her daughter's rights. If Ceara is any indication of the future of the LGBT movement, we have a bright future ahead. In 2008, Mikalene Thomas took the art world by storm, appearing in all of the major art festivals from Basel to Miami, and blossoming into a full-fledged art star in 2009 with her first solo show at Lemann Maupin Gallery. Creating works of photogrpahy, mixed media and painting, Mikalene has been exploring stereotypes of black femininity and sexuality as well as how women fit into the history of art. An out lesbian, Mikalene has turned the art world on its ear, placing previously marginalized imagery into the canon of Western art. Rachel Maddow really found her voice and solidified her standing this year as one liberal media personality not to be messed with. She stood, sat actually, stool-to-stool with Tom Ridge, Susan Rice, Tim Phillips, Rick Berman, Tim LaHaye and Jerry B. Jenkins, Richard Cohen, and so many more, never backing down, always pushing through on calling their shenanigans. 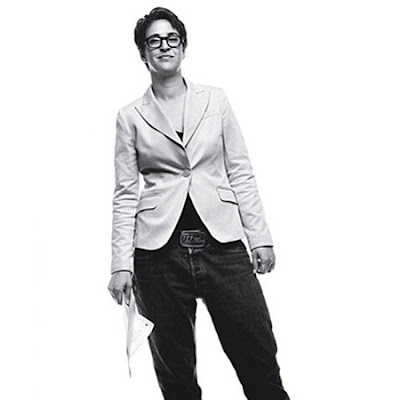 The balance of brilliance, courage, humanity, and authenticity that is Rachel Maddow is something to celebrate. It's just that much more special because she has The Gay. Sarah Schulman's resume reads like a history of the last 30 years of queer activism. She has been at the forefront of our LGBT rights struggle as a critical member of organizations like ACT UP, the Lesbian Avengers, and the arts and culture MIX festival. On top of that she's done all of it while producing nine novels, four nonfiction books and a play. This year she published the groundbreaking Ties That Bind, a book that explores the abuse of familial homophobia. Schulman has no fear in tackling those subjects we are most afraid to look at. "The question is, can the state exclude gay people from marriage, from all its tradition and prestige, and instead have a parallel institution and say it's equal? Of course not. Because symbolically it tells our society something it's been telling us for a long time: Your relationships are not the same." Submitted by karrr on Sat, 2010-01-23 12:39. I know I'm repeating what everyone is saying but it has to be said. This is a great list! It's so easy to just come up with a list full of name of people that we will all recognise but haven't actually done much, but to produce something like this takes a lot of thought and effort. Brilliant brillant article. Submitted by Queeried on Tue, 2010-01-05 09:44. Good choices here for sure - well thought out and some are obvious. It is so good to see lesbians emerge. The more visible more the chancesare we will get somewhere. Submitted by Chancesare on Fri, 2010-01-01 02:59. I didn't make ANY editor's Top 25 List?!?!?! We need more dates and more time - I need to rectify this! Submitted by Tex on Thu, 2009-12-31 11:15. Thanks team for coming up with a thoughtful, substanstial list of women. Well done! Submitted by Meiohmy on Wed, 2009-12-30 01:43. Submitted by SMBrown on Wed, 2009-12-30 19:34. I wanted to put Moon on too, but I figured that might be a little cheesy on our own site. Ha. Submitted by Julia Watson on Wed, 2009-12-30 22:03. "I wanted to put Moon on too"
I'm going to be good. DAMN - THIS - IS - HARD! Submitted by Not2Taem on Wed, 2009-12-30 22:16.
long as i'm number one in your eyes thats all that counts. Submitted by Grace Moon on Wed, 2009-12-30 20:47. Thanks for the list. I did not know who many of the people were, so now I will look them up. About 12 or 13 years ago a friend an I put together a list of horrible gay people - just for shits and giggles, and to acknowledge the good, the bad, and the ugly. Andrew Cuhnanan, etc. An interesting exercise. Submitted by skate on Tue, 2009-12-29 23:01. What an exciting year 2009 was. Even with the, emotionally charged political setbacks that we've suffered, we have been visible - and we will be even more visible in 2010. In watching the women who have stood strong, on our behalf, I find myself indebted to the women who are not normally in front of the camera. Not the actresses, and comedians. Not the writers, and news personnel. Not even Rachel Maddow... But, the women who's main direction in their lives is to unselfishly fight for all of us - the hero's who give without the glamour, and personal gain - the women who's passion it is, to care more about the rights of a complete stranger, than receiving glory for their political and/or legal actions. Submitted by MacLass_19 (not verified) on Tue, 2009-12-29 22:53. Thanks for this awesome list, Grace! It's a reminder of what I love most about Vp: it makes me feel like I'm still at Smith!!! Submitted by Jenny Aisenberg on Wed, 2009-12-30 00:32. Submitted by Not2Taem on Wed, 2009-12-30 01:04. Glad you like that-- I am on a mission to bring the linguistically inaccessible queer theory to all the peeps! We're all born naked. The rest is drag. Submitted by geek4grammar on Wed, 2009-12-30 14:43.
the whole world were more like smith! Submitted by Grace Moon on Wed, 2009-12-30 16:06. Moons, there is a women artists conference at Smith coming up in Feb. Wanna go? Submitted by Elizabeth Koke on Thu, 2009-12-31 02:03. Submitted by Grace Moon on Thu, 2009-12-31 10:52. Submitted by Not2Taem on Wed, 2009-12-30 16:53. Gracias for putting together this list, which is a fabulous way to give us hope and inspiration as 2009 ends and 2010 begins. I will help spread the word about it with a Tweet. Submitted by minniesota on Tue, 2009-12-29 21:59. Submitted by Joanne Robertson on Wed, 2010-06-30 04:03. Thanks for putting this together. Not one quibble from me. Nicely done. Submitted by Rusty on Tue, 2009-12-29 19:34. Well, almost. Houston's not a state. Submitted by Tiff on Mon, 2010-01-04 16:33.
this is the best, most well-put-together, list I've ever come across .... seriously (or, I'm actually being serious in this post). Awesome job. Submitted by ZaraThustra (not verified) on Tue, 2009-12-29 19:28. I think I'll just bookmark this to look back on when things get challenging. Submitted by Not2Taem on Tue, 2009-12-29 19:07.